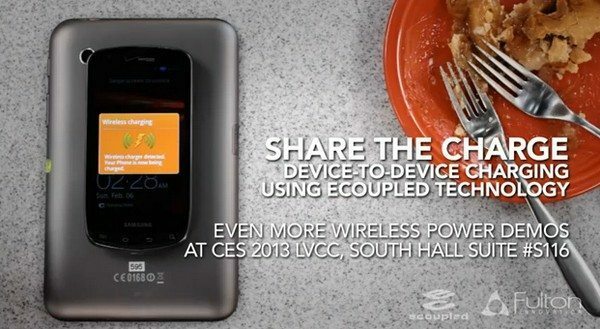 This week during CES 2013 in Las Vegas, Fulton Innovation will be showcasing and demonstrating the first ever example of two-way wireless power, which uses the Qi global standard. The firm will demonstrate a tablet being wirelessly charged and in turn used to also charge a Qi enabled smartphone simply by placing the handset back to back with the slate so that the power transfers wirelessly between the two. So basically the tablet doubles as a charging mat for the smartphone, which seems to quite a useful piece of tech. Furthermore the firm will also be demonstrating a charging mat that can charge multiple Qi compatible devices simultaneously with the charging mat adapting to the power requirements of each device whether it is a smartphone or tablet by scanning to find out just how much voltage each device requires. We have a video of the two-way wireless charging device in action for your viewing consideration below so don’t forget to head on down and mash that play button to see it working. Fulton will also be demonstrating the flexibility of wireless charging at CES 2013 by showing off an interactive printed poster that has an illustration of a DJ console that can apparently be played, and the music is made by tapping the turntable, mixer and speakers, whilst the tablet that wirelessly charges the smartphone will be placed near the poster for power. At the Fulton suite various embodiments of wireless power will be demonstrated to show how the tech can transform a users everyday life such as wireless kitchen appliances that use direct power rather than charging like mobile phones. The Nokia Lumia handset that wirelessly charges when inside a handbag, which will demonstrate wireless charge over a distance. The director of advanced technologies for Fulton Innovation, Dave Baarman has said their tech is built into 70 percent of those 10 million Qi enables devices, and wireless power is fast becoming the must have feature in the latest smartphones. There will also be a demo of furniture such as a coffee table that can apparently charge any of the 10 million Qi enabled devices on the market today, along with several smartphones that are Qi enables such as the Nokia Lumia 920, HTC Droid DNA, Nexus 4 and the Nokia Lumia 820, and there is also a demo of laptops and tablets with medium power requirement that wirelessly charge on an eCoupled enabled conference tablet.